I’ve lived in the US for 21 years now and learned from experience long ago to avoid most Indian restaurants, regardless of location. Short version of the reason: almost all of them run the gamut from mediocre to very bad. And somehow, most American foodies don’t get this even if in the last 10-15 years their awareness of and ability to make meaningful distinctions with various other Asian cuisines has expanded dramatically. The most obvious and striking parallel is with China, another large country with a dizzying variety of regions and cuisines. While the dominant mode of Chinese food in the US is still the Panda Express model, the major metros have a fair bit of granularity, with Sichuan usually leading the way. Certainly, the knowledge base of the average American food writer and foodie is much higher re various Chinese cuisines than it used to be in 1993 (I take this arbitrary date as a reference point as that’s when I arrived in the US). The same, alas, is not true of Indian food—leave alone the average foodie I can’t think of a single well-known American food writer who can be trusted on Indian food. And, by and large, the Indian restaurant scene has not changed very much since 1993. The vast majority of what’s available continues to be the “Mughlai” restaurant food of North India. Now, of course, this genre of food is also very popular in India as well, but as I’ve noted elsewhere on the blog, the versions in the US are not very good, with nut pastes and cream masking the lack of actual ability in the kitchen. Sure, there are exceptions and I’ve eaten at some of them: I ate an excellent meal at Devi in NYC in its prime (when Hemant Mathur was in the kitchen) and another at Indique in DC (these were both in late 2005/early 2006—I cannot speak to their quality now). Most of the other exceptions are in enclaves with large South Asian populations—Artesia in Southern California, the desi corridor in New Jersey and parts of the Bay Area come to mind. In these places it is possible to come across Indian food that goes beyond chicken tikka masala and dal makhni or at least places that do those things well. Of course, just as in India, South Indian vegetarian food of the Udupi variety is the other kind of Indian cuisine that’s achieved some prominence but again the quality is highly variable. And more recently some versions of chaat have showed up on almost every menu as well, usually to no good end. There are obvious demographic reasons for this, of course. Part of it is that there aren’t very many Indians in the US in general. And that small number skews more towards white collar workers than do most other immigrant groups. I would speculate that as a result when Indian immigrant entrepreneurs open Indian restaurants they don’t really have a very large trained kitchen talent pool to draw on. Thus the cookie cutter menus but also thus the inability to render those cookie cutter menus well. After all, there’s nothing wrong in principle with the items on these cookie cutter menus (as noted before, they can be found on menus all over India as well); the problem is in the execution: dishes seem to be distinguished consistently more often by menu name rather than by what’s on the plate; there’s a principle of absolute substitutability of main ingredient; and servers are even apt to ask you if would like your dal makhni mild, medium or spicy. The problem, I want to reiterate, is not that there isn’t a large amount of regional Indian food available in the US per se—that’s actually true to some degree of most Indian cities as well (though it’s begun to change slowly in the last decade). And it’s not the case, as some people will tell you, that Indians do not go out to eat Indian food—most restaurants in India serve Indian food and they’re full of Indians eating it. If Indians don’t go out en masse to eat Indian food in the US, I think it’s because the food just hasn’t been very good. Nor does it follow therefore that if you find an Indian restaurant in the US with a large number of Indians in it that it must be very good. It might, of course, be better than the nearby competition but in most places it might be the only place within easy reach. The other part is that Indian food doesn’t have the same significance and history in the US as do Chinese or Mexican food here—or as Indian food does in the UK—or the cachet that Japanese food has at the high end. And as the restaurants have not really needed to develop—they continue to cater largely to American palates—Americans interested in gastronomy have not had the opportunities to develop discriminating palates re Indian food as they have with reference to other Asian cuisines. You’ll see people post pictures of neon red kababs or tandoori chicken doused in red food colouring who would be very unlikely to praise similarly dubious Sichuan fare or bizarro sushi rolls. You’ll find people waxing enthusiastic about places that are somewhere between Applebee’s and Olive Garden in comparable gastronomic terms (we have one of those places here in the town in which I live). Now before you scoff about the Minnesota bit let me inform you that as per the 2010 census Indians are the second largest Asian group in Minnesota-–behind only the Hmong—our numbers almost doubling since the previous census. Concrete evidence of this can be seen in the large number of Indian groceries that have popped up all around the Twin Cities and their many suburbs. Up north on Central Avenue in Minneapolis there are a number of very large groceries within a few miles of each other and they’re largely patronized by Indians. So it’s possible that the Twin Cities are beginning to approach a critical mass of Indians who might dictate some level of quality control in at least some restaurants. To find what these might be I informally polled the Twin Cities Chowhound forum and also asked around among friends who’ve eaten in at least some Indian restaurants. I received the following list: Bawarchi, Malabari Kitchen, Dosa King, House of Curry (Sri Lankan, rather than Indian), Gandhi Mahal, Biryani and Copper Pot. And two Sundays ago I embarked on the first of these meals at Bawarchi. For larger pictures and detailed comments on and evaluations of what we ate please click on one of the images below to launch a slideshow. We started off with the Idli Sambhar. The idlis were fine, the sambhar and the chutneys were blah. These Medhu Vadas, however, were very good; crisp without being oily–very nice texture. This is their version of Chicken 65 and it is a little unusual. 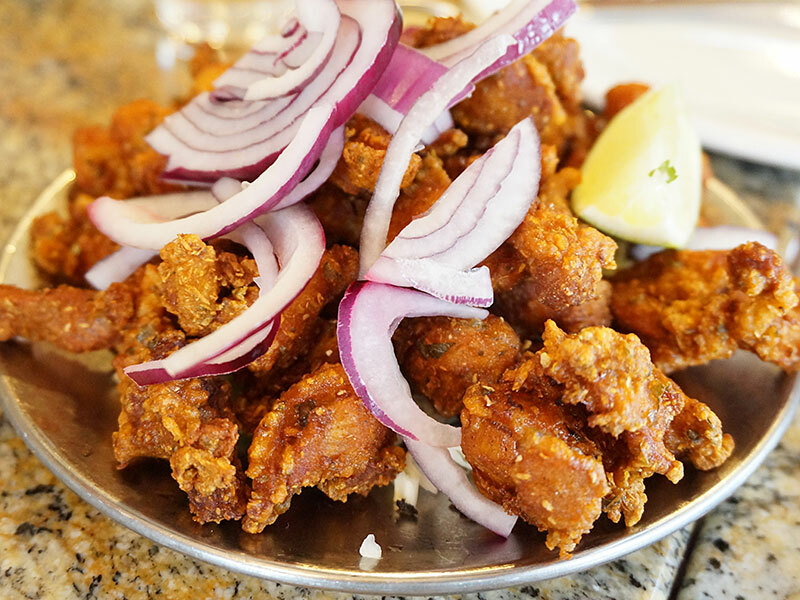 Chicken 65 is a dish of relatively recent provenance that has become very popular all over India and the diaspora in the last decade or so. It is of contested origin (claimed by Hyderabad and Chennai/Madras) but usually sits in a sticky sauce. This as you can see was completely dry. But as spicy fried chicken goes this was very good. This Mutton Sukka Varuval, made with boneless goat was even better and as it should be. My favourite of the things we ate. Similarly, there’s a dearth of South Indian vegetarian dishes on the menu despite the plethora available in the South Indian states. So we opted for the Channa Masala and it was okay. Bonus points for not having any cream in it. The Royalla Vepudu was quite nice. It’s hard to tell but there’s shrimp in there. And here it is. The sauce, which featured a lot of caramelized onion, was very nice–the shrimp themselves were a rubbery afterthought. I was looking forward to this Gongura Mutton and I thought it was fine. Gongura is a sour green in the sorrel family but it seemed to me that the sourness in this dish derived more from tamarind. Karaikudi Chicken. I’m not sure if this is some ersatz dish but it was pretty good. Naans are not really the breads to eat this kind of stuff with, but along with tandoori rotis are the only things on offer. We got some and they were fine but I’d advise getting rice with the stuff we got (we also got a lot of rice). This is the Hyderabadi Chicken Dum Biryani. Given the presence of the word “biryani” in the group’s name I had high hopes for this but it was just so-so. Now, it may well be the best biryani in the region as one person on Chowhound described it, but that’s not saying much in and of itself. The rice was too soft and didn’t really have the aroma/flavour of the chicken bound to it. All of this came to about $134 with tax and tip. There were six adults and our boys eating and so that’s probably a pretty decent value. The meal, as a whole, I thought was good and better than I expected. Some things were very good—the mutton varuval, the alleged chicken 65, the medhu vada—most were decent, and only the biryani was disappointing. I could certainly see myself eating here again—though given the distance (an hour each way for us) I’m not sure when that would be. I did talk to the manager/owner about the menu a bit, specifically about the near lack of South Indian items in the veg section of the menu (I’m not counting the dosa/idli/vada section here). The only thing that qualifies is the eggplant dish, which means that you can’t really put together a full South Indian meal here if you tried. There’s a wide range of South Indian dals and vegetable dishes that they could choose from, but it appears there’s not much deviation possible from the franchise’s template. Which is too bad as the kitchen seems capable. By the way, if you are looking for an Indian restaurant full of Indians eating in it, you have to go to Bawarchi for weekend lunch. When we got there a little after noon there weren’t very many people of any kind but by 1.30 (my people eat late) the place was hopping with Indian families, many of them South Indian. The manager told me that’s how it generally is on weekends. On to Dosa King next, I think. Errata: The original version of this referred to dal makhni on their menu. I”m not actually sure now if they do in fact have it—their online menu doesn’t list it. This entry was posted in *Food, Minnesota and tagged Biryani, Indian Cuisine, South Indian, Twin Cities, Twin Cities Indian. Bookmark the permalink. I envy your quest to try Twin Cities Indian restaurants! I took my husband to dine at his first Indian restaurant when we lived in the Twin Cities and we actually had a couple decent options in Fargo. This looks like a great option for when we go back and visit our families. Don’t envy me just yet. This was quite decent—I hope it won’t be a sharp decline from here. Count your blessings. I would take no Indian restaurant over the one my town has. Then again, I cook every day. Color me… well, Caucasian. Nevertheless, this was an excellent read. And now I’m hungry.